Racepak recently shocked the data acquisition world with the unveiling of our new track mapping system. This system, which allows you to track the position and movement of a vehicle as it travels around a track, uses GPS (Global Positioning Satellites), as its prime method of monitoring the location of the vehicle. By using the GPS you avoid the necessity of installing beacons around a track to perform this task. With this feature the set up and testing become quicker and simpler to conduct. The GPS communicates with a sensor that is attached to the onboard data recorder and integrates the information with the other recorded data. 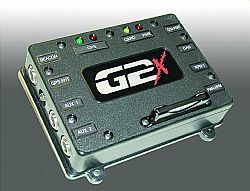 The GPS track mapping system can be ordered as an integral part of a V300 recorder, or it can be added as an accessory unit to existing V300 and V500 recorders. Racepaks GPS track mapping software provides users with a number of features not found in other systems. Through the software you can break the track down into any number of user-defined segments in addition to whole laps. These segments can be compared against the same segment from other laps within the recording session, or against those from other recording sessions. Whole laps can be compared in the same manner. Each segment or lap that is monitored will provide you with the ability to look at such items as entry and exit speed, minimum and maximum speed, entry and exit time, elapsed time, split time, acceleration and braking G-force, lateral G-force, altitude, GPS heading and velocity, combined with all other functions that you may be monitoring with your data recorder. To say that interest has been high is an understatement. Recent testing with a noted Winston Cup team drew the attention of a large number of teams who were also at the track. If you are an oval track, road race, or boat racer you owe it to yourself to check out this amazing new system. You have seen them in the cockpits of the top fuel dragsters and funny cars. They even appear often on drag racing TV shows as the camera zooms in on them to show what a driver or crew chief is looking at. We are talking about the Racepak Pro Dash, the three screen, and multifunction digital display panel. These dashes have been used for the past couple of years exclusively with our Pro II data recorder, but now due to popular demand they will be available for use with the V300 and V500 data recorders also. The V-Series version of the Pro Dash will mirror the capabilities of the Pro Series dash. It will have the ability to display up to 40 functions that are being monitored by your data recorder. The large main screen will always have a bar graph and three large digital displays, while the two smaller screens on each side will contain three digital displays each for a total of ten displays at once. Each screen can be scrolled through four different displays for a total of 40 monitored functions. All displays are user-defined for the function you choose. The dash is backlit for nighttime use. Pro dashes measure 3.800" tall x 9.385" wide x .625" deep making them ideal for use in application such as Super Comp and Comp dragsters which have limited room for gauges. The housing is machined from billet aluminum. Weight is a mere 17 ounces including its carbon fiber mount.